An 18-month-old baby allegedly killed by her adoptive father died following "a single event", a court has heard. Matthew Scully-Hicks, 31, of Delabole, Cornwall, denies murdering Elsie Scully-Hicks at their Cardiff home. She was rushed to hospital after becoming unresponsive but died four days later after suffering extensive damage to her brain. A consultant paediatrician has told Cardiff Crown Court Elsie "suffered significant trauma". "I think that it would be improbable that all these things arose separately," Dr Marian McGowan told the jury. "The likelihood is that they are part of a single event. I think that the only explanation is that the child suffered significant trauma." Dr McGowan added she thought Elsie would have been distressed and become unwell quite rapidly - and her condition would have deteriorated so quickly that she would have become unconscious. She said the management of Elsie's head injuries in hospital was "entirely appropriate" and in line with guidelines. Mr Scully-Hicks, a part-time fitness instructor, and his husband Craig Scully-Hicks had formally adopted Elsie two weeks earlier. 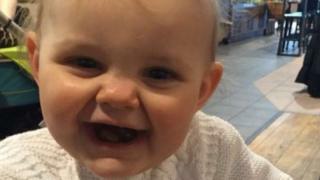 The court has previously heard Elsie's injuries were "very typical" of babies who have been shaken and her injuries were likened to those of a "car crash" victim. Dr McGowan prepared a report after seeing reports from other doctors and Elsie's notes. She said Elsie had been a healthy baby before she died in May 2016. Asked by Paul Lewis QC, prosecuting, if she had seen any reports of significant trauma in Elsie's past that would account for the injuries, Dr McGowan replied: "No I haven't."